Griffin Memorial COGIC has a long-standing relationship with the Weber County Jail system, where we provide worship services to inmates on a weekly basis. We are also affiliated with the Davis County Work Center in Farmington, Utah. Through the Jail Ministry we have helped bring souls to Christ and show them a better way. The food pantry was born through the perseverance of Mother Allen. 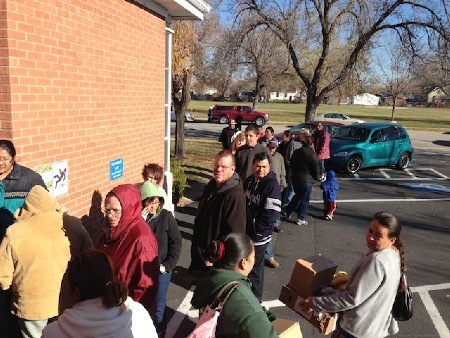 The pantry serves the neighboring Ogden community, as well as families between Salt Lake City and Idaho Falls, Idaho. The pantry provides food weekly and has been a blessing to many. It has also bridged cultural gaps and transcended language barriers, as our church building is located in West Ogden, which is heavily-populated with Spanish-speaking residents. Through the food pantry ministry we are able to meet the immediate physical needs of families, while offering the love of Christ. Our pastor loves music and is an advocate for music in the church. Our local music department includes the Griffin Memorial Mass Choir, the Youth Choir, the Men's Chorus, the Praise Team, and a full ensemble of musicians. The music department is invited to sing at numerous occasions and is always prepared to usher in the presence of the Lord in our local services. Soul Winners Across Town (SWAT) is an outreach ministry to reach those who are lost. Bishop Allen has implemented the 7 Keys to the Kingdom program at Griffin Memorial COGIC, where we ask for just "one minute of your time" to introduce accept Jesus as your Lord and Savior. This is a charge for the entire body and we endeavor to win souls for the Lord. Griffin Memorial COGIC is a young church and a place to learn and grow. We have teaching agents for all ages in our Sunday School, including a Nursery-Kindergarten class for babies and toddlers. We also have the Sunshine Band for children through age 12 and Purity Class for those ages 13 through 17. These sessions teach young people about the Word and also how to apply it to their lives. During our morning worship services, we operate the Day Care on an as needed basis. Jesus loves the little children and so do we. So, bring them with you when you join us any day of the week!